Oscar Lios, a native Costa Rican, is an extremely versatile man, with an unbridled passion for the arts and life. You could perhaps find him playing guitar and singing, leading a band, building a bicycle, or expressing his innate artistic talent painting visions with light-filled traces of the Renaissance era. Lios creates stunning images with very succesful concepts and techniques, and is without a doubt one of the promises of the region in visual arts. 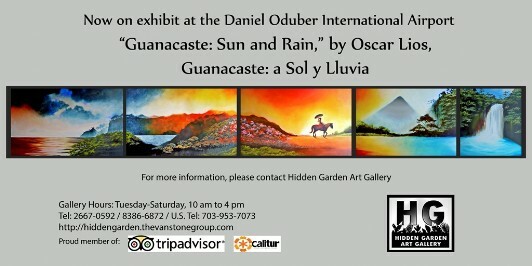 Join us at the Hidden Garden Art Gallery on Saturday, January 12th, 2013 to welcome Oscar's newest exhibit, and even hear some of his music! "In the Garden of the Night," is full of magic and mystery. "Walking in the night garden is to walk in my dreams, in this intimate space where I'm happy," says Lios. From A.M. Costa Rica, and La Nacion, Ancora. Read about Oscar Lios in La Nacion, Ancora, and A.M. Costa Rica. Exhibit Opening: September 18, 2010.